18 Jan 2019 --- Danone North America has announced the launch of two individual yogurt lines that tap into both plant-based and sugar reduction trends. The first, coined Two Good Greek Lowfat Yogurt, is a dairy products line that touts indulgent taste, low calories and reduced sugar content. The second is Good Plants, a dairy-free, probiotic yogurt alternative, made with almond milk. Two Good will launch in February 2019, while Good Plants is already available. The products will be marketed under a new “Do Good By You” campaign: “‘Do Good By You’ is more than a tagline, it’s a brand mantra that encourages self-care every day. We look forward to learning about all the inspiring ways people choose to do good for themselves and having them make Two Good a part of those moments,” says Prabha Cheemalapati, Vice President of Yogurt Marketing at Danone. Innova Market Insights has listed “Eating for Me” as its number 6 top trend for 2019, reflecting the growing demand for individualized nutritional options. Plant-based diets are increasingly popular and “The Plant Kingdom” is one of Innova Market Insights’ Top Trends for 2019, as plant-based options are flourishing in a range of categories, with dairy alternatives in particular on the rise. The Good Plant range touts 40 percent fewer calories and 70 percent less sugar than most dairy yogurt alternatives. The range includes flavors such as Strawberry, Vanilla, Chocolate coconut and Lemon Meringue. Click to EnlargeThe Two Good range is produced with an innovative slow-straining process that is now patent-pending, according to the company. Each cup is slow-strained to become a creamy Greek yogurt that is high in protein and with 85 percent less sugar than average yogurts. In total, Two Good boasts 2g of sugar, 12g of protein and 80 calories per cup. It is gluten-free, non-GMO and includes flavors such as Strawberry, Blueberry, Vanilla, Peach and Mixed Berry. “Milk is the starting point for yogurt, and sugar is naturally occurring in milk. As people continue to look for ways to reduce sugar from their diets, we've been working hard to find a way to remove some of the naturally occurring sugar found in milk so that yogurt continues to be a preferred choice,” says Thierry St. Denis, Danone North America's Senior Director of Research and Innovation for the yogurt category. 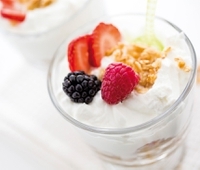 “Sugar is increasingly an area of interest for consumers, which is why our yogurt makers prioritized developing a recipe to address it head-on,” notes Amanda Blechman, Registered Dietitian, and Senior Manager of Scientific Affairs at Danone North America. To introduce people to the new product lines, the ‘‘Do Good By You” campaign will launch in the US this month via TV and online video. Danone says it will inspire people to “do good for themselves” and make its new yogurt lines a part of their self-care routine. Danone has recently also responded to the growing fiber trend by adding two new flavors to its popular Dannon Activia Probiotic Dailies line, launched last year in the US. The new flavors are fortified with prebiotic fibers. Served up in a convenient “daily shot” format, the yogurt-based dose promises to deliver billions of live and active probiotics, and on-trend flavors: Lemon & Ginger and Honey & Ginger. If you found this article valuable, you may wish to receive our newsletters. Subscribe now to receive the latest news directly into your inbox. I would like to share this article with you as I believe you may find it interesting. May I also remind you to subscribe now to the FoodIngredientsFirst newletter service. This will bring timely news, key trends and product developments right into your inbox. FoodIngredientsFirst.com is edited and hosted by CNS Media BV, Arnhem, The Netherlands.The leading international publisher on food ingredients and food product development.